Ilaya Raja, or Ilaiyaraaja as he's more commonly known, is a South Indian composer I haven't featured much on this blog due to him working predominantly in the Tamil film industry, aka Kollywood. He was however responsible for a few Hindi soundtracks, among them 'Sadma' which included the stunning 'O Babuaa Yeh Mahua'; after being posted here it was sampled by Danish DJ collective Den Sorte Skole for their 'Lektion III' project. 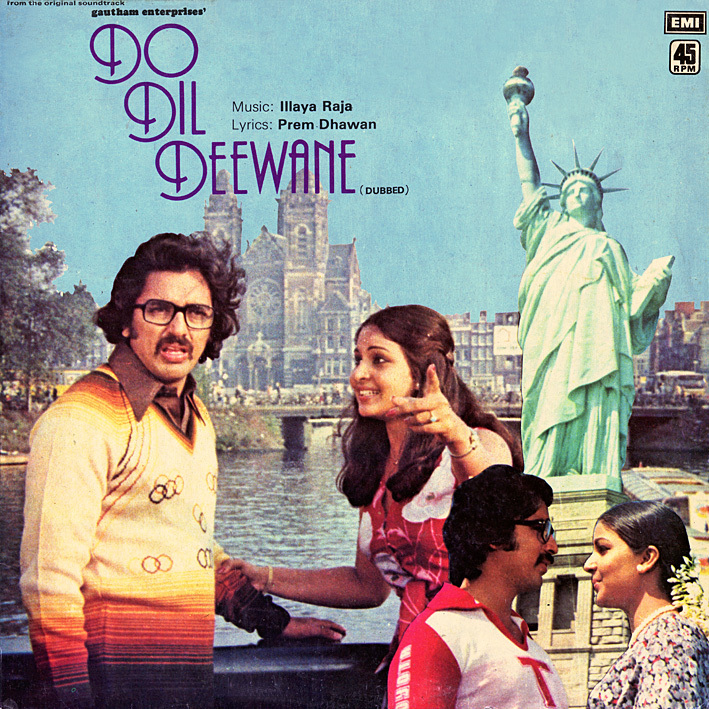 Like 'Sadma', 'Do Dil Deewane' was a Hindi version of an original Tamil movie. And like 'Sadma', it boasts an excellent soundtrack, consisting of some delightfully sunshiny pop gems, sounding if not totally unique, at least different to almost anything I've heard from Bollywood music directors. All sung (or co-sung) by S. Janaki who's recorded somewhere in the vicinity of 15000 songs. There's an alluring happy-sad melodicism to them, like something out of the classic songwriting school of masters such as Burt Bacharach. You can hear it on 'Dilbar Aa' ('Germaniyin Senthen'), and perhaps mixed with a bit of Abba on 'Yeh Jahan Tum' ('Azhagu Aayiram'). They're both fantastic tracks, neither of which I tire of listening to these days. The rest aren't half bad either; 'Aaj Khoye Se Ho Kyoon Tum' ('Naan Undhan Thaayaaga') and 'Kitne Rangeen Hai' ('Azhagiya') both have a curious country & western feel (if you can imagine country & western augmented by 80s synths) and 'Hai Pyar Ka Sangam' ('Dheiveega Raagam') is enticingly driven by a quirky stop-start rhythm. None of them seem to be available on YouTube so I've linked to the Tamil originals (parenthesized) which are. And a word on the sound quality: It's kind of horrible; wobbly like a warped cassette tape – but you could argue that that only lends to its charm. Regardless, a highly recommended soundtrack. May be you should start reviewing Ilaiyaraaja's popular south indian albums. Then you will be busy for the next 5 years at least.. There are easily 100 albums which are as good as this one and sadma.. He is the by far the best composer India has ever seen..
Haha, don't tempt me! Would have been a different blog though; this one will remain primarily a Bollywood one I think. Thank you 3rd Floor. Nice site!